They're called "common" dolphins, which seems unkind. On "whale watching" trips off Newport Beach, CA, though, I've seen pods that contains hundreds or even thousands of them. Ironically, the more dolphins there are in the water, the harder it is to capture a good photo and a sense of their joire de vivre. Also adding to the challenge of photography as well as the appeal of these social animals: they're incredibly quick. If you try to focus on them as they're jumping, it's too late. 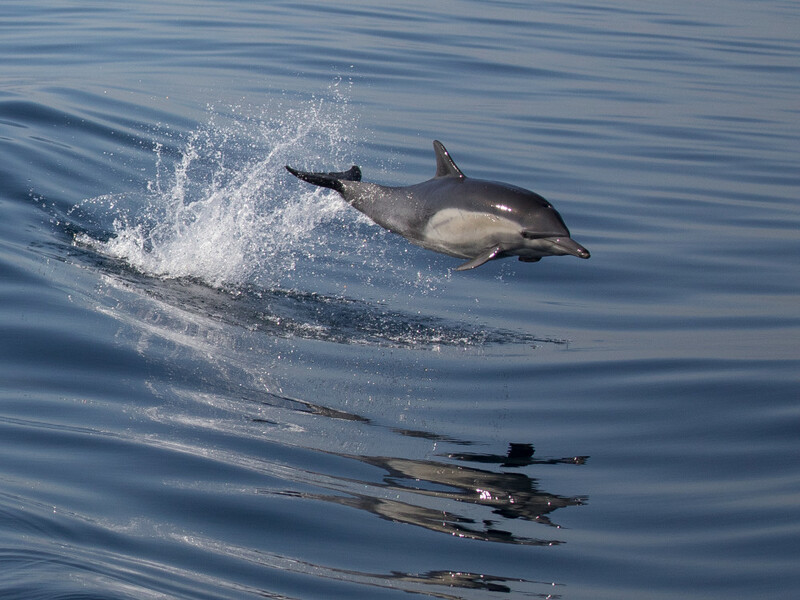 To get this image, I tracked a dolphin as he dashed behind our boat and waited for him to leap through the ultra-calm waters of the Pacific Ocean. Looking at this image, it's easy for me to temporarily put aside worries of politics, social issues and more and just enjoy a carefree moment. I hope you agree.